What is the Tab Selection Order on a Slide? Many times, in PowerPoint, you may find yourself with layered content that makes it difficult to format, adjust animations, etc. A great tip is to know about the TAB key. Select any object on the slide, then click the TAB key to rotate through selecting every visible object on the slide. Bonus tip: use SHIFT + TAB to reverse the selection order. So, how is the selection order of tabbing chosen? Look to the SELECTION PANE. The Selection Pane is the order that the TAB key follows. 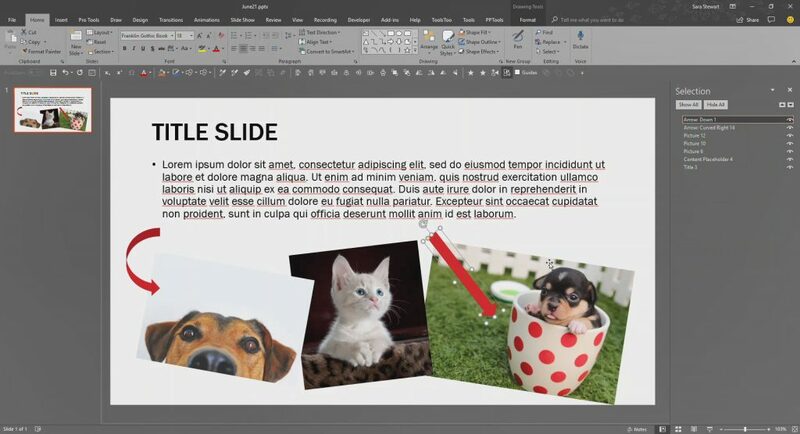 It not only shows every element on a slide, but has the functionality to change the name of each element, and enables turning on/off the visibility of any element on a slide. To turn on your selection pane, go to HOME > SELECT > SELECTION PANE from the drop down. Or for all of TLC Creative we have the Selection Pane on our custom QAT. With the Selection Pane open, use the TAB key and the selected objects go down (or up with SHIFT + TAB) the object list. Or click on any element in the Selection Pane to select any object on the slide. Use the TAB key to move through the layers of objects on the slide. The tabbing order follows the Selection Pane order, also referred to as the z-order, or the stack order.